Wallis Blue Dress Size 16 . WALLIS BLACK Lace OVERLAY KNEE LENGTH SHIFT DRESS SIZE 10 - Party/wedding. Condition is Used. Dispatched with Royal Mail 2nd Class. Stunning Wallis Red Floral Chiffon Draped Dress size 14 !! Stunning Wallis Floral Chiffon Draped Dress, red stretch/bodycon dress layered with asymmetric multicoloured floral print chiffon layer , size 14, pit2pit 19-20" !!. Condition is Excellent/Used/Worn Once ! Dispatched with Royal Mail 2nd Class !! Proof of posting always obtained. Please check out my other items, new items added daily and combined post available 😊 ! 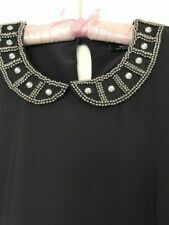 Womens Designer BNWT "WALLIS" Black Chiffon Evening Dress - Size 14 (As a personal opinion, i'd say that with this being an evening style gown, its a small size 14, please bear this in mind) Condition is Brand New with Tags - please check photos before purchasing. Happy to refund upon return of the item. Will be posted within 2 working days of payment being recieved and will be dispatched Royal Mail 2nd Class. Wallis Silk Purple & Cream Maxi Dress Size 16. Condition is New with tags. Bought off eBay sadly too small in the bust area, fits every where else. Side zip and tie at the back of the neck. Beautiful dress, ideal for summer wedding/holidays. Proof of postage always obtained. Lovely flattering shift type dress in a silky material. Please see other items. Wallis Size 16 Blue Patterned Dress. Condition is Used. Dispatched with Royal Mail 2nd Class. It's a strapless swing style dress in a bright pink jersey fabric. Midi length. Ladies Size 18 Wallis Maxi Dress , in a heavy polyester jersey which hangs beautifully and has a flattering design . Zip back. Ladies summer occasion dress Floppy feel material Size 16 By Wallis Loops for belt but no belt VGC Please ask any questions Always combine postage, as in as many items in one parcel sto save on postage Pay pal please within 24 hours of winning bid Any problems, don't leave negative feedback,I always wash and make sure items are in good condition, but sometimes an item slips thru the net so please email me first, if their is a problem with the item not mentioned you will obviously get a full refund and return postage paid, no questions asked....i am a very fair and friendly ebayer!! My feedback is extremely important to me......thankyou for looking at my items. FABULOUS STRETCH PRINTED PENCIL WIGGLE DRESS. UK SIZE 12. Ladies Blush Beautiful Lace Dress and bolero shrug Size 16 From Wallis. Condition is Used however it is in excellent condition from a non smoking and pet free home. Very flattering fit with the shrug is ideal for many occasions. Dispatched with Royal Mail 2nd Class. 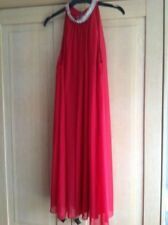 This auction is for a Wallis Maxi Dress Red Tropical Print Strappy Stretch Summer Holiday Size 16. It has been washed and worn but is in good condition although the strap has been repaired on one side(see pic) it has been stitched but would need redoing. The measurements are 19/20” pit to pit and 53” pit to hem. Please feel free to email me with any questions. 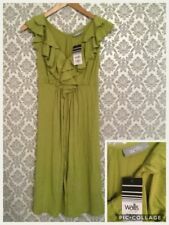 ladies long evening dress size 18 green. Condition is Used. Dispatched with Royal Mail 2nd Class. Orange crochet lace overlay. SIZE 12 PETITE. Concealed back zip fastening with loop over 3 button fastening at back neckline. A really gorgeous occasion dress. Stunning Wallis Black dress with black sequin detail on the right shoulder,the back is draped with a band going across. It also has a small split at the back to make walking easier. The front is rouched at the side to give a drape effect and also disguises any problems in the tummy area. It is a stunning dress and is BNWT. Length 47”. Please pay within 24 hours. I only post to the UK. From a clean, smoke and pet free home. Beautiful dress from Wallis ideal for summer wedding or Ladies day at races ,ivory with a lovely blush /natural polka dot overlay from a clean pet and smoke free home any questions please ask thanks for looking. The dress is made from a stretch polyester and has a non stretch chiffon overlay at the top half of the dress. It has a slit down each sleeve. Gorgeous dress for any occasion and in great condition! Really pretty Ladies Size 14 Wallis Black and White Spotty Dress in a fit and flare design. Light weight fabric. Condition is Used. Any questions please ask and thank you for looking. WallIs black jersey tunic dress with a floral chiffon layered wrap overlay. Size 16 Petite. Armpit to armpit lying flat : 19”. Ladies maxi dress. Length -59. In very good condition. Wallis Size 10 Dress Floral Occasion Wedding Christening Smart Formal Evening Party Thanks for looking. Please check out my other items. wallis 16 green Prom Dress. Condition is Used. Dispatched with Royal Mail 2nd Class. WALLIS LADIES PRETTY FLORAL SHIFT DRESS SIZE 16. IT'S MADE FROM A LOVELY QUALITY SOFT STRETCHY MATERIAL IN A VERY ELEGANT STYLE ♥. Wallis Dress Size 18. Dispatched with Royal Mail 1st Class. Absolutely stunning gorgeous Wallis Black Long Dress suitable for Evening /Cruise Wear size 16/18. Condition is Used but in excellent condition from a smoke free home. Please feel free to ask any questions. Dispatched with Royal Mail 2nd Class. Wallis Size 10 Dress Floral Occasion Wedding Christening Smart Formal Evening. Condition is Used. Dispatched with Royal Mail 2nd Class. Genuine WALLIS with all inner labels intact. Soft lightweight stretch jersey. Thin centre panel with ruching to each side - difficult to show because of pattern. Other Stuff. Slip over fit. Waist - 18". worn only once, in great condition. Ladies Wallis Dress Size 16. Used Simple but stunning I’m having a massive sort out so please take a look at my other items All from a smoke and pet free home Dispatched with Royal Mail 2nd Class. ladies Wallis black lace dress size 16. Condition is Used. Dispatched with Royal Mail Signed For® 2nd Class. Nwot Stunning Wallis White/Pink Floral Chiffon Draped Dress size 12 !! Nwot Stunning Wallis Floral Chiffon Draped Dress, pink stretch/bodycon dress layered with asymmetric multicoloured floral print chiffon layer , back zip fastening, size 12, pit2pit 19-20" !!. Dispatched with Royal Mail 2nd Class Signed for !! Proof of posting always obtained. Please check out my other items, new items added daily and combined post available 😊 ! 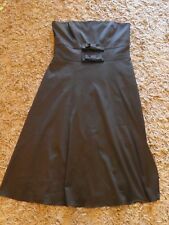 Black Dress Size 16, Wallis, Evening Dinner Dress.has like a crinkle effect and is a pull on dress no zips. Good Condition is Used. Dispatched with Royal Mail 2nd Class. Dress length on the front from the shoulder 100cm. 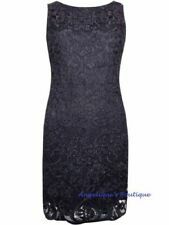 NWOT Wallis Petite Navy Blue Lace Dress Size 18. Dispatched with Royal Mail 2nd Class. Smoke and pet free. Please make sure you look at all pictures and are happy with the item condition before bidding. Please note free postage is only for UK. Offers Will be considered. Wallis Evening Dress New Size 16 Black. Dispatched with Royal Mail 2nd Class. Wallis Chiffon Cape Dress, sleeveless with cape overlay with sequins . Condition is New with tags. Dispatched with Royal Mail 1st Class. Features a fit and flare skater style. Beautiful burgundy, maroon lace detail evening dress size 10. Lace detail to top and sleeves. Perfect occasion party, wedding guest dress. One button closure to back, pull on. A gorgeous, unusual black dress with net overlay, from Wallis, size 16 With cream flowers on the bodice and hemline of the net overlay, the net is in godets around the hemline. Quite difficult to photograph. With slim tie belt, this beautiful dress has been worn only nice for a wedding. Please e mail any questions and thank you for looking. Wallis Dress Size 12 - Cream Flower Print Skater Style - BNWT - £50 New!